Indigenous businesses will be boosted across the Riverina thanks to a free visiting entrepreneurship program by the NSW Government and Charles Sturt University (CSU). 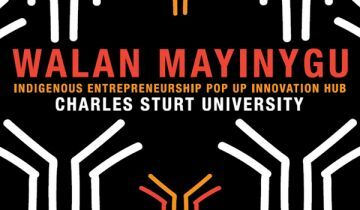 The Walan Mayinygu Indigenous Entrepreneurship Pop-up Hub is visiting Albury’s Library Museum from Tuesday 10 to Thursday 12 October. Member for Albury Greg Aplin said the hub offered a range of free Indigenous business development workshops and activities. “Walan Mayinygu is pioneering NSW's first regional Indigenous entrepreneurship program developed by Charles Sturt University’s Associate Professor Michelle Evans to nurture and grow Indigenous business, technology, and innovation. “The pop-up hub is funded by the NSW Government's Boosting Business Innovation Program which is providing $1.5 million to each of NSW's 11 universities - including Charles Sturt – and the CSIRO to help businesses drive innovation. “I encourage all Indigenous business-people, entrepreneurs, those interested in starting businesses and Indigenous youth to get along to the pop-up hub,” Mr Aplin said. Through the Boost program, Charles Sturt University is also driving innovation through the CenWest Innovate business accelerator in Bathurst and an AgriTech Incubator in Wagga Wagga to support startups and SMEs. Deputy Premier and Minister for Regional NSW, Skills and Small Business, John Barilaro, said the pop-up hub will ignite indigenous business potential. “There is strong opportunity for Indigenous business growth and the pop-up hub will provide professional advice to help harness and direct the exciting creative passion we see in our Indigenous communities,” Mr Barilaro said. Professor Evans, who is with the University’s Faculty of Business, Justice and Behavioural Sciences and is based in Albury-Wodonga, said Walan Mayinygu’s visit will allow Riverina Indigenous residents to be mentored by established Indigenous entrepreneurs and businesspeople. “The pop-up hub will offer a program of Indigenous business education sessions including business masterclasses, practical workshops, panel discussions, a business plan and pitch development studio, guest speakers and networking. “Professional development opportunities will cover topics including procurement skills, managing staff, legal Issues and business compliance.